André Greipel’s won two stages of the Tour of Turkey so far and there’s an interesting story behind current race leader Natnael Berhane of Eritrea. But the race isn’t over. One curiosity from the race so far has been Adam Hansen’s custom shoes. 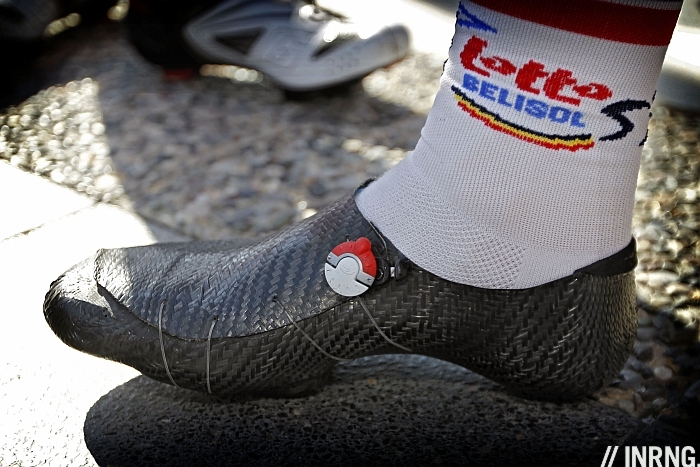 Now prototype gear gets tested in races but the difference here is that the Lotto-Belisol rider is making his own shoes. In a way this is pure Hansen. He moved to narrow handlebars in 2010 and has now encouraged others in his time to copy. Greipel is on 40cm width bars. A computer programmer by background Hansen told RIDE Magazine (Issue 59) that he speaks five languages “PHP, MySQL, ASP, VB, Java” and has designed logistics software for his team which he hopes to sell to others. Riders often have sponsorship contracts for items outside of the team-issue kit meaning many are free to choose sunglasses and shoe sponsors. Hansen could have posed for a “I chose [insert shoe brand]” ad and got a few thousand Euros and several pairs of shoes but instead he’s opted for what looks like a pack of carbon fiber pre-preg, some fishing line and a ratchet dial from an old Sidi shoe. It all makes sense, after all the shoe is really just the means to hold the foot to the pedal and moulding the carbon to suit your foot shape can be done at home. Do it right and you can get custom shoes and save on weight. One innovation that might be less successful is electronic gearing. Within the space of a few days we’ve seen several high profile failures of electronic gears. Last week brought us Bradley Wiggins hurling his bike away only for it to come to an elegant stop against a wall. If the Giro fails he can always target the pétanque world championships. His bike throw only happened after problem with his gearing. On Sunday we saw Alejandro Valverde complain he couldn’t contest the final of Liège-Bastogne-Liège because of a problem with the gear shifters. And two days ago Bryan Coquard was ruled out of the sprint in the opening stage of the Tour of Turkey because of the same problems. But mechanicals have always been a problem in the sport. Punctures are common, the same for breakages after a crash. So are reports of problems with the electrical gears down to the electronics? Or the rapidity and volume of electronic news where component failures can be quickly relayed? After all the story was Wiggins’s electric gears failed but nobody mentioned Nibali’s bike worked. The Tour de France starts in just over two months’ time. We know the 19 World Tour teams who get an automatic invite but Tour company ASO can still choose three more. Only they’ve yet to announce the invites. Normally you’d think Europcar are certain and then Cofidis and Sojasun get the nod. But it’s said ASO is looking wider and hesitating about who to invite. What is certain is that the delay doesn’t help anyone. Teams that could get an invite need to be preparing race schedules and training plans and uncertainty over what they’ll be riding in July is a big deal. For example should a team count on riding in July or should it instead aim to peak in June for, say, the Dauphiné or Tour de Suisse? Time is running out. One area where people can plan for the Tour de France is the TV production since France Télévisions have bought the rights to the Tour until 2020 along with a range of other sporting events. This matters wherever you’ll be watching the Tour because the French TV will produce the images. The production quality is excellent, in part thanks to diligent planning. Finally talking of grand tours and TV, one tweet from Giro boss Michele Acquarone. He’s snapped the French capital on his smartphone and added a word of appreciation. You can spot the Eiffel Tower. But where exactly was the image taken? From the offices of TV company TF1 which owns Eurosport. Talking to TV channels is part of the job but we’ll see if the Giro has new plans for TV in 2014 and beyond. First time writer, long time reader. Please, if you can, mention the (new?) channel BeIN as an option for North American HD coverage. I have been watching Romandie coverage from Eurosport UK in HD, live no less! For those of us in the US, this is a pretty big deal. They purport to carry the Giro also this year. None of the Twitterati have mentioned anything about this so I thought you could get it out there so we can support BeIN. I have been watching through Dish Satelite TV, but I believe there are other cable companies that carry BeIN. Thanks for everything, you do a fantastic job with this sport. But Romandie is on Sky Sports, not Eurosport, in the UK. Maybe you’re seeing that? Eurosport have the Tour of Turkey. Comcast carries beIN, at least in my neck of the woods (Boulder). The sports package that includes beIN1 and 2 is an extra $10/month. Worth it IMO, especially if they will be carrying other races. Electronic shifting isn’t going anywhere. For the regular consumer/fred/recreational rider, it’s an absolute god-send. Crisp, clean, fast, and a child can adjust it. Shimano will do whatever it takes to eventually appease the peloton, but they have all the crucial patents and all the cards to play. SRAM is way behind on this one, and as much as I love campy they haven’t hit the future-vision side of the technology as much. I have a Merckx EMX with a mix of Chorus/Record and a Cervelo S5with Di2. I am not sure I will ride the Merckx much, it at all anymore. I’d never buy a bike with mechanical again. Definitely not a fad. Electronic rules. Yes, I hear lots of happy reports too. But some high profile problems live on TV are bound to dent sales or make people hesitate. Will just be more incentive for Shimano and Campy to improve the product. They will work out the issues. It’s not going anywhere. Have to agree with David here, having ridden Dura-Ace Di2 on a number of bikes in both road and TT setups it’s definitely the future however distasteful that might be to the purists. The high profile failures don’t help the sales case, but we rarely hear of any specifics in race commentary when riders have a mechanical, so perception of reliability it’s likely skewed to some degree. Also, it does appear that when a rider on a bike fitted with electronic shifting is having issues (other than a flat) commentators are quick to cast blame, when often it isn’t clear what the problem is. This is then negatively reinforced by a lack of follow up comments post-race from the teams, mechanics or vendors (which is to be expected given sponsorships). Being a cyclocross fan I watched Klauss VanThornhout and Kevin Pauwels both suffer jammed chain/front derailleurs on several occasions this season and in each instance both riders missed out on the podium subsequently or didn’t finish. There is never any mention of what is happening but it’s obvious to this bicycle mechanic. Those derailleurs will not allow you to pull the chain back up. It’s a new chain scenario. I’ve worked on enough Di2 setups to know the weakness of the system is in the jammed front shift. Doesn’t happen often but when it does the likelihood of saving it is very small in my experience. A cable operated derailleur you can futz with and recover mostly. It won’t break your fingers either! You are correct Morris. I am wrong on Klaas. Got too excited. Good catch! I would further clarify it is not a frequent occasion in my experience. When equipment has been brought to me I have only the riders input, which as we know ranges from JRA to very attentive. There are other factors that can contribute from poor assembly/maintenance or frames not meeting the components optimum operational dimensions. We know these issues also hinder the cable operated equipment too though. Not curmudgeoning here just $0.02, with poor fact checking. Prices will need to come way down for many, recently I needed to replace my rear derailleur, shimano ultegra, cost approx £80. £200 for ultegra Di2 and more for campagnolo versions of EPS. With four bikes to equip it’s beyond my price level. Love the handmade shoe story.. Welcome eccentricity and I picture him in a Girona apartment with welding goggles on A-Team style! Paris visit with a theodolite for the Eurosport office visit scoop I hope? A.H – When I reply I live in the Czech Republic I always get a baffled look towards me. I think it’s part of my character. I’m quiet and do my own thing. I like to see and experience the world in a different manner. Living there was something I wanted to try, so I went and did it, love it and never turned back. While I do believe in life after cycling I also run a few things on the side parallel with my cycling, Czech opens an amazing door of opportunity for a foreigner while being a great country to invest in. is this april 1? that is way too far out!! Love the shoes, innovative and minimalist. Electronic shifting is a solution to a non problem but the geeks will love the sound of the mechs whirring. But why still have two gear shift levers. Surely you should be able to just change from bottom to top gear on one lever with the electronic brain working out the correct front and rear mech positions? Bikes – Motorbikes – Batbikes. Next thing you know the riders will be doping! The single shift lever is technically possible (and I believe has been done using a custom Di2 setup). However impractical in use. An electronic system however well tuned still requires a degree of mechanical sympathy to use, much like a cable actuated system. Shifting under load is never as smooth as when the power is backed off slightly, this is true for both front and rear shifts, but particularly the former. When you consider the gear ratios on a bike, there are considerable overlaps between different chainring and cassette combinations (53×23 is for example almost the same gear as 39×17). If just the ratios available are considered, then at certain cassette positions the call for a lower/higher gear would require a change of both derailleurs simultaneously for multiple successive shifts. Although shifting at the front and rear at the same time is doable it is an aggressive action, and not recommended. This sort of system could spring these shifts on the user without notice which is likely to increase wear and the potential for failure (as well as significantly reducing battery life). That is considering Di2 and EPS as essentially dumb systems where there is little logic or computational processing happening. A more advanced system, could be programmed with knowledge of the ratios and maybe advise the user when a double shift could be available. This would allow for example smooth transition to the large chainring at the top of a climb. Personally, I find the progress in electronic hub gears interesting. 11 speeds and all hidden away. I’ve not ridden them so can’t comment on how good/bad they are. But a race tuned (and much lighter version) could be an attractive proposition. Hub gears are too inefficient to be an option for racing. They have some advantages but power transfer is not one of them. Not to mention the weight! Vile shoes, I am still using Mavic Zap, done 10K each year for the last 20 years without fault. It is easy to vilify new tech because of the novelty. Look how the consumer world hesitated with carbon hoops. Now, even Ambrosio Nemesis wheelsets are a rare sight on Paris Roubaix. That sounds to me as though Wiggins might have been testing something not yet released to us mere punters. Anyone got any ideas what Evans is referring to? I have to wonder how the failures of electronic group sets compares with the failure of their mechanical cousins over the years compare? Was “Chaingate” mech or electronic? The Schleck incident? He was on old SRAM Red (mechanical). I run the same gear and have never been able to cure the occasional dropped chain. I’ve never used SRAM gears and it rarely happens to me but when I do drop a chain I can always put it back on again with the front mech, usually whilst still rolling and have never had to use my hands to do it. It seems to be the fastest easiest (and cleanest) way to do it. Am I missing something? Try that uphill when you don’t have much momentum and are applying significant torque with each pedal stroke. I don’t think any shifting system could cope with that – you’d need a clutch. Diamondjim – I had that same problem (dropped chain using SRAM Red) but have found the cure by upgrading the crankset to the latest and switching front mech to the “yaw” version. Works perfectly although you do end up with a redundant click on the shifter where the trim used to be (which is no biggie). Adam Hansen making his own shoes seems quirky and unnecessary when he could call Bont, D2 or one of the other custom shoe makers for an exotic pair of shoes. That is what makes it endearing. I would assume they are really light, but hell to walk around in at a coffee shop. The ability to perambulate Coffee shops being what custom shoes are designed for? Same reason some folk might paint a room themselves while others might get a decorator in. If he can, then why not? Given his background it only makes sense, and what better way to spend your off days and time out of the saddle than tinkering with crafting a comfy foot bed? As many hours as these guys spend riding, and as tuned-in they are to their own bodies it makes sense to me. Not to mention the fun factor of playing with carbon lay-ups and crafting something with your own hands. Maybe he will market a kit for doing same at home, sort of like Shrinky Dinks or the BeDazzler? Not even Graeme Obree made his own shoes* so much respect to Mr Hansen. As you pointed out in your article, I was impressed by Wiggo’s bike throw as well. It was eerie how the bike wouldn’t go down on the ground even though he obviously intentionally hurled it to the ground a la John McEnroe-like to a tennis racket. Even Wiggins looked temporarily surprised and bemused when it swerved and came resting by the side of the wall. I bet he would have gotten an earful (more) from Pinarello and his ds if the bike had actually hit the ground. Not seen the Wiggins chuck but if it landed rolling there is a pretty good chance that the bike would reach the wall because bikes do inherently stay upright if they are rolled without a rider on board. See: http://www.newscientist.com/article/mg21028141.700-bike-to-the-drawing-board.html (you’ll need an account to view it but it is an interesting publication ;-). Are there are ny rumours on who ASO is thinking of inviting as the TdF wildcards. Cofidis really upped the budget this year and took on some riders with the aim of doing more in the race so I imagine that it would be very bad news for them if they didn’t get an invite. Personally, I’d like to see Sojasun there because they are one of the teams that really goes about things in the right way. Having picked up the latest Ultegra Di2 grey-market online for only $1500 some months back, it’s not just the high quality shifting or light effort required. With Di2, no need to change out worn shift cables and housing or adjust as the cables stretch, saves time and expense in the long run. Charging the battery every month or so is hardly much effort. I’ll never go back to SRAM shift paddles flexing and breaking off and clunky shifting. If Shimano offered more Di2 demos, they’d sell a lot more. The product sells itself once you use it the first time. Primary motivations/priorities of the vendors to push electronic shifting? Production Cost/Profit: Lower long range production cost in labor and materials, encourage purchases to replace “outdate” mech versions that work fine, higher profit margin pricing elec above mech. Likely for new/first time buyers, the choice of e-shift is very compelling. As some older, spend thrift amateur racing types… with a sunk investment in SRAM Red 10 gruppos and 10 speed racing wheels, I cannot envision a switch to eshift and 11 speed for another 4-5 years when a total equipment reset seems necessary. Resale (e.g. Ebay) pricing on 10 speed mech shift, rim brake will plummet soon, eh? Adam Hansen has always had a special interest in gear. Some 8 years ago he was a frequenter of the weightweenies online forums, always discussing how to get quicker through optimizing his gear. Johan Coenen was another active visitor of those forums and when he got a pro contract later on (which he was very happy with), he was sad to not be able to use his beloved lightweight gear any more. How easy is it to fix problems with electronic groupsets? Theoretically, with mechanical ones you can replace any part yourself and keep it running fine. For example, if an electronic shifter were to fail do you need a whole new shifter? And are replacement parts more expensive? I agree it seems like it’s here to stay. But the price currently puts it out of the reach of many. Look at how the price has come down on carbon frame sets though. The more they sell the cheaper it will get. MTB rider here so electronic isn’t an option. I love wrenching though and electronic would spoil a lot of my fun! I would assume that it will be the same as currently i.e. if it’s Shimano you would have to replace the whole shifter (Shimano do not sell spare parts) whereas Campag I guess you may be able to replace some parts, depending on what it is (that is pure conjecture, based on the fact Campag make small parts available).